While the common trend among international travellers is to visit Seoul first before exploring the rest of South Korea, those who venture into the lesser-known city of Busan are pleasantly surprised by a culturally rich and ever-thriving metropolis that, in addition, boasts privileged views of the mountains, the sea and even a river. It is the second Korean city in terms of population and the true neuralgic centre of the economy thanks to the frenzy daily activity of its port, the busiest in the nation. 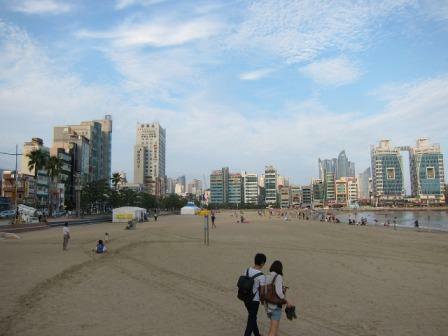 These factors have contributed to its popularity as a luxury destination for tourists, who love the premium service and amenities of the many four and five-star hotels in the city as well as the idyllic sunsets that can be enjoyed from the coast of Busan and its several beaches, among which Haeundae is the largest and most visited. If you are looking for flights to Busan, know that you can either fly directly to Gimhae airport from other cities within South Korea or from overseas with some of the main international airlines. If you travel to Korea from the US and choose Busan as your gateway into the country, you are likely to have a layover in Tokyo Narita airport of Japan. Other international routes with a layover or stopover before your connecting flight to Busan include most of the main airports in China, Hong Kong, Macao, Taiwan, Thailand, Malaysia and Germany. In case you are flying to Incheon airport instead and want to get from Seoul to Busan, the best way to cover the distance of 330 kilometres separating the two points is by train, operated by the Korail company and taking 2 hours and 45 minutes approximately. The ticket fares applicable vary according to seat class, and range from 40 to 65 euros. A cheaper way to travel from Seoul to Busan is by bus, although it takes longer (4 hours and 30 minutes) and you will need to go to secondary stations in order to take it (Seoul South and Busan West). A single ticket costs 23 euros. Below, you will find recommended hotels in Busan -South Korea- that provide excellent guest service in top locations, thus enabling you to roam the streets, spend time at the beach and visit the main attractions in town without the need for long commutes, as everything is within reach. Conveniently located by Gwangalli Beach in an optimal spot for travel photographers, this 4-star hospitality establishment also lies close to several bus and metro stations, parks, museums and theatres. Gimhae airport is 15 kilometres away, while some of the main attractions in the city –like the Busan Aquarium and Haeundae Beach– are less than 4 kilometres away from the Aqua Palace. This hotel near the beach in Busan provides guests with spacious suites and rooms that can accommodate from couples to families/groups of up to 6 members under the same roof. Each unit offers stunning sea views, free WiFi connection, air conditioning, living area, flat-screen TV, coffee and tea facilities, comfortable beds and fully-equipped bathrooms. When making a reservation, you will be given the option to add daily breakfast (continental on weekdays and buffet-style on the weekends) for a surcharge. Additionally, you may use the spa at discounted rates, order laundry and ironing services and spend time at the onsite café and karaoke. Aside from the good quality of the amenities and premises, the good transport connections available within short walking distance and the possibility to request airport pick-up and drop-off service for a nominal fee makes it an ideal option for those travelling to Busan. The Shin Shin is equally a top choice for business travellers for its executive style and spaces where they can organise meetings and combine work with leisure. The well-appointed rooms of this hotel in Busan have private bathrooms, their occupancy ranging from individual to family. WiFi is available all throughout, and the onsite Korean restaurant serves both meals and a hearty daily breakfast. As is the case with other hotels in the region, guests are invited to relieve stress at the Karaoke inside the facilities. Whether you are taking a work trip or planning a romantic break with your significant other, this might be just the right place to stay in South Korea. In a strategic spot with easy access to different districts by underground train (line 1), the restaurant, free parking and fitness centre of the Crown Harbor are some of the reasons why travellers choose it; however, it is the breathtaking harbour view that makes them want to come back. The ample deluxe rooms or suites of this hotel in Busan feature en suite bathroom with amenities, cable TV and a living area, and guests may enjoy extra services such as left-luggage and currency exchange. You can commute to Seoul by train from the railway station situated only 15 minutes on foot away, or else drive to Gimhae airport, located roughly 30 minutes by car from the establishment.